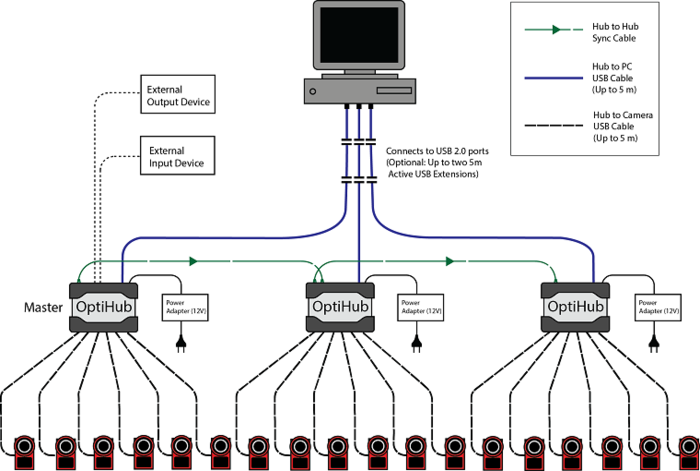 This page provides guidelines and recommendations to consider when cabling and wiring USB-based and/or Ethernet-based OptiTrack motion capture system. An Ethernet camera system networks via Ethernet cables. Ethernet-based camera models include Prime series (Prime 13, 13W, 17W, 41) and Slim 13E models. Ethernet cables not only offer faster data transfer rates, but they also provide power over Ethernet to each camera while transferring the data to the host PC. This reduces amount of required cables and simplifies the overall setup. Furthermore, Ethernet cables have much longer length capability (up to 100m), allowing the systems to cover large volumes. Ethernet cameras connect to the host computer through a Gigabit (1000 Mb/second) Ethernet port. Note: the camera network should be segmented from the office or other local area networks to avoid interference and congestion. If the computer used for capture is connected to an existing network, then a second Ethernet port or add-on network card can be used to connect the camera network. When the camera network is not isolated, frame drops may occur. Note: Turn off your computer's firewall for the particular network in order to connect the camera network to the host PC. There are multiple categories for Ethernet cables, and each has different specifications for maximum data transmission rate and cable length. For an Ethernet based system, category 6 or above Gigabit Ethernet cables should be used. 10 Gigabit Ethernet cables – Cat6e, Cat6a, and Cat7 — are recommended in conjunction with a 10 Gigabit uplink switch for the connection between the uplink switch and the host PC in order to accommodate for the high data traffic. Ethernet system with one Ethernet switch. Ethernet system with more than one Ethernet PoE switches. OptiTrack’s Ethernet cameras require PoE or PoE+ Gigabit Ethernet switches, depending on the camera's power requirement. The switch serves two functions: transfer camera data to a host PC, and supply power to each camera over the Ethernet cable (PoE). The switch must provide consistent power to every port simultaneously in order to power each camera. 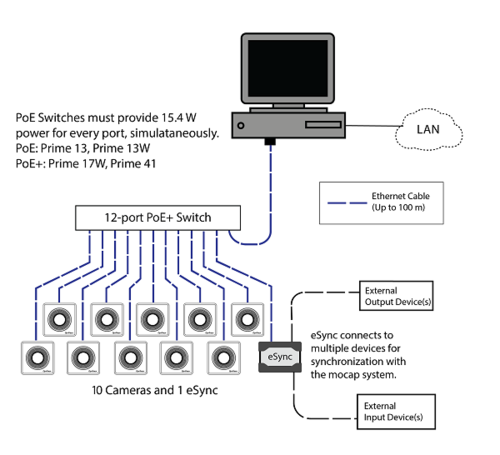 Standard PoE switches must provide a full 15.4 watts to every port simultaneously. Prime 17W and Prime 41 cameras have stronger IR strobes which require higher power for the maximum performance. In this case, these cameras need to be routed through PoE+ switches that provide a full 30 watts of power to each port simultaneously. Note that PoE Midspan devices or power injectors are not suitable for Ethernet camera systems. The eSync is used to enable synchronization and timecode in Ethernet-based mocap systems. Only one device is needed per system, and it enables you to link the system to almost any signal source. It has multiple synchronization ports which allow integrating external signals from other devices. When an eSync is used, it is considered as the master in the synchronization chain. With large camera system setups, we recommend connecting the eSync onto the aggregator switch for more stable camera synchronization. If PoE is not supported on the aggregator switch, the sync hub will need to be powered separately from a power outlet. 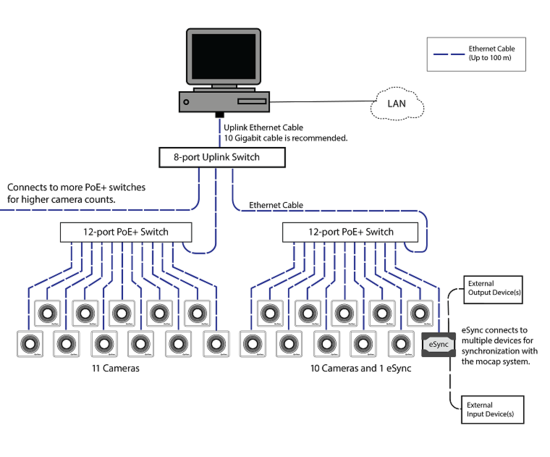 If the number of cameras included in the system exceeds the number of ports available from the switch, a star topology setup with an uplink switch connecting subsequent switches will be required. In this case, large amounts of data will be transferred through the uplink switch. In order to cope high bandwidth, it is recommended use the 10 Gigabit uplink switch and connect to the host PC with a 10 Gigabit cable – Cat6a, Cat6e, and Cat7. Otherwise, system latency can increase and frame drops may occur. A USB camera system provides high-quality motion capture for small to medium size volumes at an affordable price range. USB camera models include the Flex series (Flex 3 and Flex 13) and Slim 3U models. USB cameras are powered by the OptiHub, which is designed to maximize the capacity of Flex series cameras by providing sufficient power to each camera, allowing tracking at long ranges. For each USB system, up to four OptiHubs can be used. When incorporating multiple OptiHubs in the system, use RCA synchronization cables to interconnect each hub. A USB system is not suitable for a large volume setup because the USB 2.0 cables used to wire the cameras have a 5-meter length limitation. If needed, up to two active USB extensions can be used when connecting the OptiHub to the host PC. However, the extensions should not be used between the OptiHub and the cameras. We do not support using more than 2 USB extensions anywhere on a USB 3.0 system running Motive. 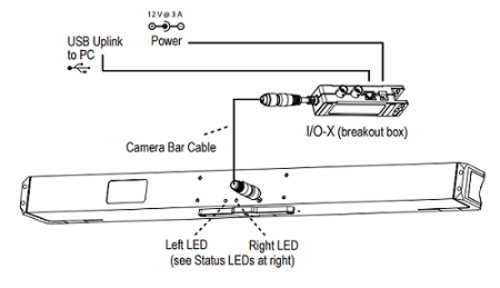 Wiring diagram of a Flex series camera system. OptiHub 2 for USB camera systems. OptiHub(s) and a power supply for each hub. USB 2.0 Type A/B per OptiHub. USB 2.0 Type B/mini-b per camera. The OptiHub is a custom-engineered USB hub that is designed to be incorporated in a USB camera system. It provides both power and external synchronization options. Standard USB ports do not provide enough power for the IR illumination within Flex 13 cameras and they need to be routed through an OptiHub in order to activate the LED array. When connecting hubs to the computer, load balancing becomes important. Most computers have several USB ports on the front and back, all of which go through two USB controllers. Especially for a large camera count systems (18+ cameras), it is recommended that you evenly split the cameras between the USB controllers to make the best use of the available bandwidth. OptiSync is a custom synchronization protocol which allows sending the synchronization signals through the USB cable. It allows each camera to have one USB cable for both data transfer and synchronization instead of having separate USB and daisy-chained RCA synchronization cables as in the older models. 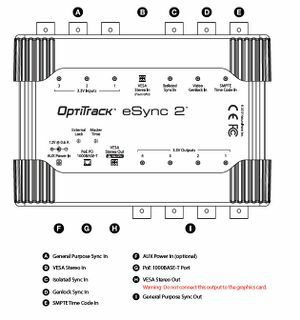 The OptiSync is a custom camera-to-camera synchronization protocol designed for Flex series cameras. The OptiSync protocol sends and receives sync signals over the USB cable, without the need for RCA sync cables. This sync method is only available when using Flex 3 or Flex 13 cameras connected to the OptiHub. The Wired Sync is a camera-to-camera synchronization protocol using RCA cables in a daisy chain arrangement. With a master RCA sync cable connecting the master camera to the OptiHub, each camera in the system is connected in series via RCA sync cables and splitters. The V100:R1 (Legacy) and the Slim 3U cameras utilize Wired Sync only, and therefore any OptiTrack system containing these cameras need to be synchronized through the Wired Sync. Wired Sync is optionally available for Flex 3 cameras. Tracking Bars — V120:Duo and V120:Trio — are also USB camera models, but they are standalone devices featuring an integrated hub and cameras. The Tracking Bars are power by their USB hubs, and the USB output from the integrated hub is directly connected to the host PC using a USB 2.0 cable (A/B) without routing through the OptiHub. The integrated hub also features BNC Sync In and Sync Out ports which can be connected to external devices. At this point, all of the connected cameras will be listed on the Devices pane and the 3D viewport when you start up Motive. Check to make sure all of the connected cameras are properly listed in Motive. Then, open up the Status Log panel and check there are no 2D frame drops. You may see a few frame drops when booting up the system or when switching between Live and Edit modes; however, this should only occur just momentarily. If the system continues to drop 2D frames, it indicates there is a problem with how the system is delivering the camera data. Please refer to the troubleshooting section for more details. › Q : Which camera models can be used together in the same system? A: OptiTrack camera models can be categorized by their connector cable types: USB and Ethernet. Generally, cameras sharing the same cable type and sync mode can operate together within the same system, with the Flex 13 being the only exception. Flex 13 models have a different timing mechanism compared to other USB camera models. Therefore, they are not cross compatible with other USB cameras. Below are some considerations that should be made when incorporating different camera models simultaneously. Flex 13 cameras can only operate with other Flex 13 cameras. Flex 3, Slim 3U, and V100 cameras can operate together, but when V100:R1 or Slim 3U cameras are introduced into the system, all cameras must be synchronized using Wired Sync, rather than OptiSync. Slim 13E, S250e, and Prime series cameras utilize Ethernet cables for their connections, and they can be used together in the same system. Prime Series and S250e cameras can operate together in mixed camera environments. The frame rate for the camera group will be limited to that of the camera with the lowest FPS. › Q : [USB Cameras] Cameras are dropping from Motive. USB cable condition: First of all, confirm the cable condition. Faulty cables may result in frequent disconnections which may result in cameras dropping in Motive. Thus, all USB cables should be in a good condition. To confirm the connection, make sure the LED indicator on each connection port is illuminating on the OptiHub. USB cable length: Next thing to check is the cable length. Cameras may drop connections if the USB cable length limitations are not respected. USB 2.0 cables should not exceed 5m in length. Also, if you are using a 5m USB 2.0 A-B cables to connect the OptiHub to the Host PC, connect it directly to the motherboard because the connection between a USB module to the main board may introduce extra length. USB extension: If you are using active USB extensions, make sure they are properly used. Incorrect use of USB extensions may result in connection issues. USB extensions should be used only between the OptiHub(s) and the host PC; Extensions should not be used to extend the camera-to-hub connection. Also, no more than one extension should be used per each hub and no more than two extensions should be used. USB 2.0/3.0: Using USB 3.0 ports may cause connection problems because USB 3.0 specs have different restrictions. Use USB 2.0 ports if available. If there are only USB 3.0 ports to use, you can disable USB 3.0 from the system BIOS. › Q : [Ethernet Cameras] Prime series, or Slim13E, cameras dropping 2D frames. A: 2D frame drops are logged under the Status Log and it can also be seen in the Devices pane. It will be indicated with a warning sign ( ) next to the corresponding camera. You may see a few frame drops when booting up the system or when switching between Live and Edit modes; however, this should occur only momentarily. If the system continues to drop 2D frames, it means there is a problem with receiving the camera data. In many cases, this occurs due to networking problems. Disable any firewall or anti-virus software on the host PC. Often, these software interferes with the camera network and cause frame drops. Use a dedicated network interface controller (NIC) card for uplinking the camera system to the host PC. Ethernet adapters on common motherboards are not well suited for receiving camera data. Update network cade driver to up-to-date. If you have an eSync in the system, connect it to the aggregator switch. It will provide more stable synchronization between the cameras. › Q : [Ethernet cameras] Cameras not detected at all. Disable any firewall or anti-virus software and check again to see if it resolves. Often, these software blocks the camera network. Update the network card driver. Make sure nothing is misconfigured on the network switches. Some switches have its own traffic control tools that might interfere with how the camera data and the sync signals are transmitted. If the cameras are still not detected, contact tech support. When doing so, launch Motive and take a note of the behavior of how the back LED lights on the cameras are flashing. This would be helpful when troubleshooting the issue.